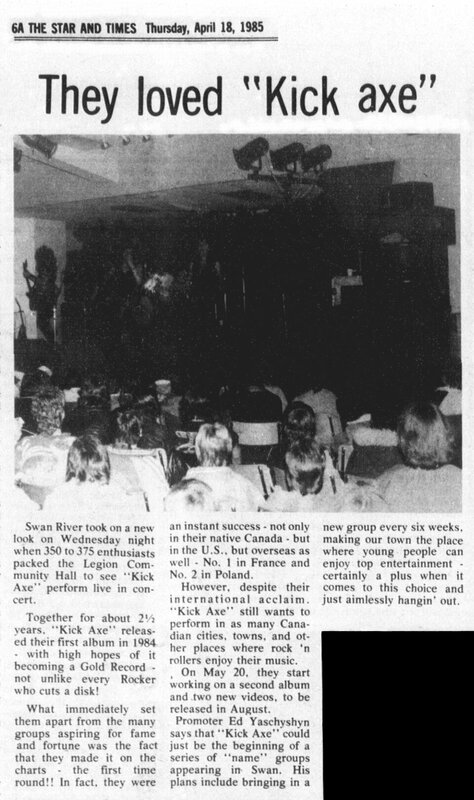 [article]: They Loved "Kick Axe"
Swan River took on a new look on Wednesday night when 350 to 375 enthusiasts packed the Legion Community Hall to see "Kick Axe" perform live in concert. Together for about 2 1/2 years, "kick Axe" released their first album in 1984 - with high hopes of it becoming a Gold Record - not unlike very Rocker who cuts a disk! What immediately set them apart from the many groups aspring for fame and fortune was the fact that they made it on the charts - the first time round!! In fact, they were an instant success - not only in their native Canada - but in the U.S., but in the overseas as well - No. 1 in France and No. 2 in Poland. Hovewer, despite their international acclaim, "Kick Axe" still wants to perform in as many Canadian cities, towns, and other places where rock'n'rollers enjoy their music. On May 20, they start works on a second album and two new videos, to be released in August. Promoter Ed Yaschyshyn says that "Kick Axe" could just be the beginning of a series of "name" groups appearing in Swan. His plans include bringing in a new group every six weeks, making our town the place where young people can ejoy top entertainment - certainly a plus when it comes to this choice and just aimlessly hangin' out.